The mourning cloak butterfly is one of the first to emerge in the spring; any warmer days trigger the end of their dormancy. These large butterflies are distinctive with their mahogany colored wings outlined in a cream color and a series of bright blue spots in a band inside the paler outline. 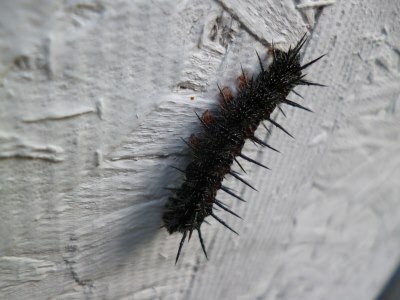 Their caterpillars are pretty noticeable too; they look as though they're bristling with spines, but luckily, they just look ferocious. Their sides and back are covered with tiny white spots. 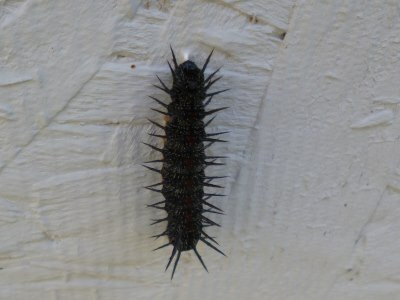 They feed on willows, elms and poplars, and once they reach a certain weight, they will seek out a good spot to pupate. This one chose a great spot - directly behind a window leaning against the shed. I'm sure he didn't realize that he was in full view through the window; but now I get to keep tabs on the miraculous metamorphosis from dark grey larvae to an amazing adult butterfly.